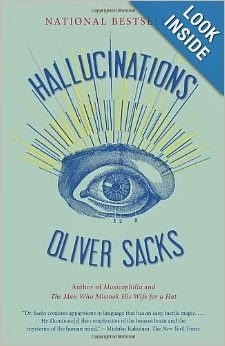 Oliver Sacks' Hallucinations is an excellent read. The gist of the book is that hallucinations are much more common than reported or suspected and that people have them for all sorts of reasons including migraines, inadvertent drug use, purposeful drug use, Parkinson's, sleep, epilepsy, old age, death. And in all manners: images of self, images of others, smells, landscapes, shapes, sounds. Sacks feels that what these hallucinations reveal about the structure of the brain is important and shows that our minds have specialized structures to handle facial recognition, pattern recognition, language, and more. That might seem obvious, but hallucinations gave an insight into the way the brain handles these constructs even pre-MRI. There's a spot in the book which I can't find where he posits that our brains may be doing something a computer does not which is taking all the various data it receives and running semi-random/semi-structured loops constantly, restructuring what it has available to make up new information. Sacks goes so far as to say the brain may just be playing. That's a fascinating idea for AI, that a sentient machine might need ongoing loops of background noise in order to make sense of the world. "Robert Hughes, in the opening of his book on Goya, writes about a prolonged delirium during his recovery from a nearly fatal car crash. He was in a coma for five weeks and hospitalized for almost seven months. In intensive care he wrote, 'One's consciousness...is strangely affected by the drugs, the intubation, the fierce and continuous lights, and one's own immobility. These give rise to prolonged narrative dreams, or hallucinations, or nightmares.'" [p. 186]. And this sounds almost exactly like the visions I had when I closed my eyes - the ones where I used Stripe the Pillowpet zebra to slowly get rid of them (although it may have been time at work). In particular, look for "German" on my post about visions. Ties nicely to his example of Anne closing her eyes and seeing Chinese movies. "Then came a more radical change. Anne found herself in the back of "a 1950s Chinese bus on a propaganda tour of Chinese Christian churches." She recalls watching a movie on religious freedom in China projected onto the rear window of the bus. But the viewpoint kept changing--both the movie and the bus suddenly tilted to odd angles, and it was unclear, at one point, whether a church spire she saw was "real," outside the bus, or part of the movie. Her strange journey occupied the greater part of a feverish and insomniac night. // Anne's hallucinations appear only when she closed her eyes and would vanish as soon as she opened them." [ p. 190-91]. Finally - this has nothing to do with my accident. I'm just highly amused that someone has hallucinations where the end result should be screaming THAT'S NUMBERWANG!